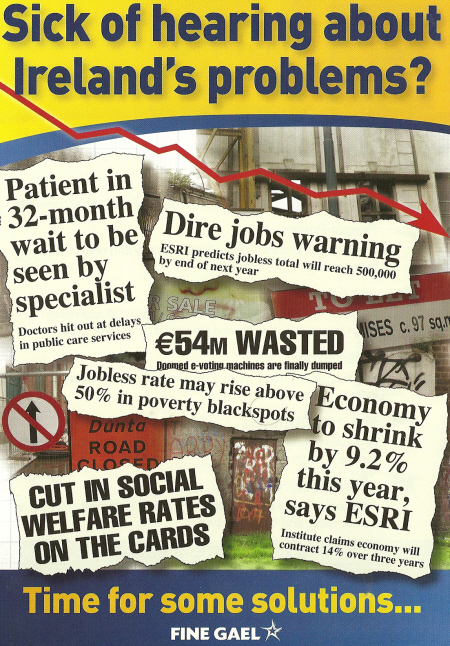 From the 2004 Local Elections a leaflet for Fine Gael candidate Pat Crimmins who was running in the Donaghmede ward for a seat on Dublin City Council. Despite polling a respectable 1,645 he missed out on a seat. In 2007 he was co-opted onto the Council and held his seat in 2009. There’s also a nice picture of him in a Dubs jersey with a pair of Roller Blades around his neck… to illustrate his campaigning for an ice rink in Donaghmede !